**Part 2 of 2. 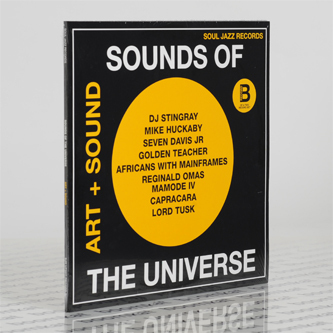 Gatefold 2LP** Collecting 8 tracks lifted from the cracking 'Art + Sound' series of Afro-futurist and esoteric dance music compiled by London's Sounds of the Universe. Volume 2 yields a funked-up Detroit electro ace by DJ Stingray, plus warm and wavey house by Mike Huckaby alongside the raw house soul of Seven Davis Jr, swaggering Scots funk from Golden Teacher, and a phantastical Afro-futurist vision from Africans With Mainframes. whilst the shop's own Capracara gets down on a warped garage house skip, 'Hard Ticket to Hawaii', and local cat Lord Tusk kills it with an Ethiopiques-style cyber-steppers dub.